If someone you know has had an ectopic or tubal pregnancy or you're worried that you're at risk for one, you might be wondering how doctors diagnose these pregnancies. Get the facts on diagnosis and treatment with this review. An ectopic pregnancy, also called a tubal pregnancy, that develops undetected for too long can become life-threatening, especially if it leads to a ruptured fallopian tube or another such emergency. Not every ectopic pregnancy diagnosis, though, begins or ends in the emergency room -- sometimes doctors can catch and treat these pregnancies earlier. Here's how. Many women who have a tubal pregnancy see their doctors after having bleeding or cramping in early pregnancy. Sometimes these symptoms occur even in normal pregnancies, but at other times, they can be signs of miscarriage or ectopic pregnancy. A doctor may specifically suspect ectopic pregnancy if a pelvic exam reveals an abnormal lump in the tubal area or if the woman is having excessive abdominal pain or tenderness. If there is any sign of a ruptured tubal pregnancy, the woman should go straight to the emergency room, but in nonemergency cases, the doctor may run tests to confirm or rule out the possibility of tubal pregnancy. The diagnosis includes a combination of hCG levels and early ultrasound. The hCG levels in an ectopic pregnancy often rise slower than normal, meaning they will not double every two to three days in early pregnancy. This may be the first clue that leads the doctor to investigate the possibility of tubal pregnancy, but hCG levels on their own cannot confirm an ectopic pregnancy. Slow-rising hCG can occasionally occur in a viable pregnancy or may also mean a first-trimester miscarriage. In addition, many ectopic pregnancies will have normally rising hCG levels, so doctors usually will order an ultrasound if there is a chance that the pregnancy may be ectopic. If the ultrasound shows a gestational sac in the uterus, the doctor can most likely rule out tubal pregnancy as a cause of slow-rising hCG levels or bleeding and cramping. 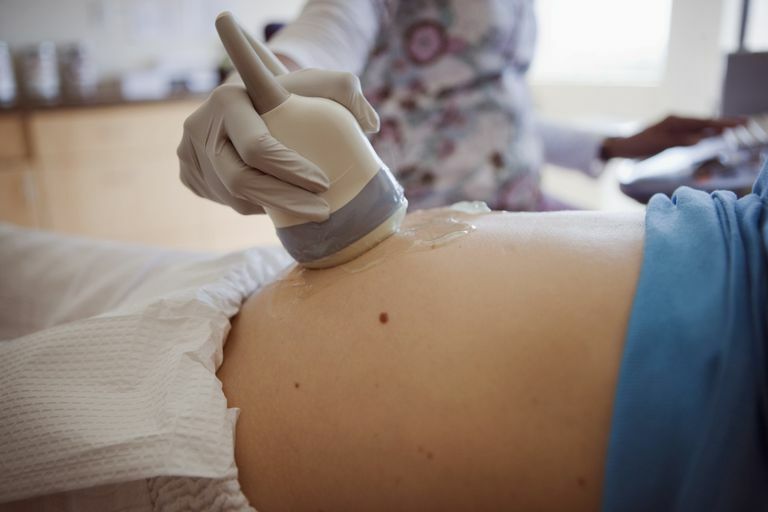 Other times, ultrasound will reveal the gestational sac and fetal pole (potentially with a heartbeat) being present in the fallopian tube, which obviously will lead to an ectopic pregnancy diagnosis, but frequently the sac will never be visible at all on an ultrasound in a tubal pregnancy. If the doctor confirms that the pregnancy is ectopic but there is no sign of rupture, the doctor may recommend a medication called "methotrexate" to terminate the pregnancy or may recommend monitoring the hCG levels if the pregnancy seems as if it may end naturally. If the doctor feels there is a significant risk that the ectopic pregnancy may rupture the tube, the treatment may be surgery to end the pregnancy. Tubal pregnancies are not viable and can be fatal if they are left untreated. Lozeau, Anne-Marie and Beth Potter, "Diagnosis and Management of Ectopic Pregnancy." American Family Physician Nov 2005.